The government has announced a mandatory and rigorous 90-day verification of all firearms certificates. In a statement on Wednesday, Interior CS Fred Matiang’i said the exercise will begin on December 17. It will be carried out by the Firearms Licensing Board (FLB), which will also “establish, maintain and monitor a centralised electronic register of all private citizens holding firearms”. During the moratorium, all civilian firearm holders will be required to appear before the FLB in person. They must also produce their weapons for review and certificates for authentication. “Upon qualification, they will be issued with new smart licences,” the statement stated. Fred Matiang’i noted that there are irregularities in the oversight of gun ownership and use by private citizens. “Some lapses in the licensure of firearms dealers, civilian holders, and shooting range owners have led to the illegal possession, transfer, misuse, and trafficking of such weapons thereby posing major threats to national and regional security,” he said. The tough-talking CS further warned anyone possessing a firearm illegally must surrender it to the government within the 90-day moratorium ending on March 17, failure to which they will be met with the full force of law. Any private citizen in possession of a firearm or ammunition without certification after the deadline will be deemed to have acquired it illegally. Prohibited firearms range from automatic/semi-automatic self-loading military assault rifles to guns that fall outside the functioning cycle described in the Firearms Act. They include G3, AK-47, M16 rifle, Uzi, Sterling-Patchett MK5, CZ Scorpion Evo 3, and MP5 among others. 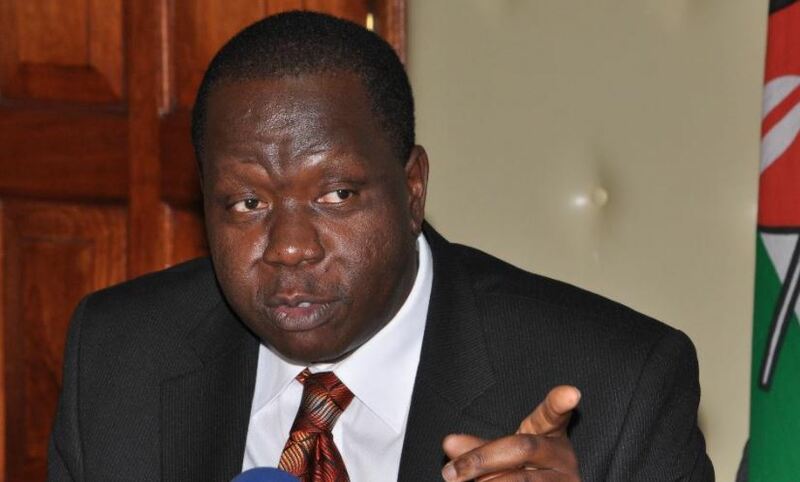 “All preferential certifications and special considerations that might have been accorded earlier for specific civilian firearms holders under whichever circumstances are hereby abrogated with an immediate effect,” Matiang’i said. He added that only police officers under the National Police Service, Kenya Defence Forces, Kenya Wildlife Service and members of other security agencies will be exempted from vetting. Officers from the National Police Reservists will be vetted by Inspector General of Police Joseph Boinnet.